We’ve all got one. That dreaded drawer usually in the kitchen that ends up being a catch all for things that don’t have a home elsewhere. And I guarantee that junk drawer is really hard to keep organized. Am I right? One of the biggest eye sores in my home is the junk drawer. It’s spent the last 6 months (or more) being too full to even open properly. That’s how bad it was folks. And in case you don’t believe me, here’s proof. 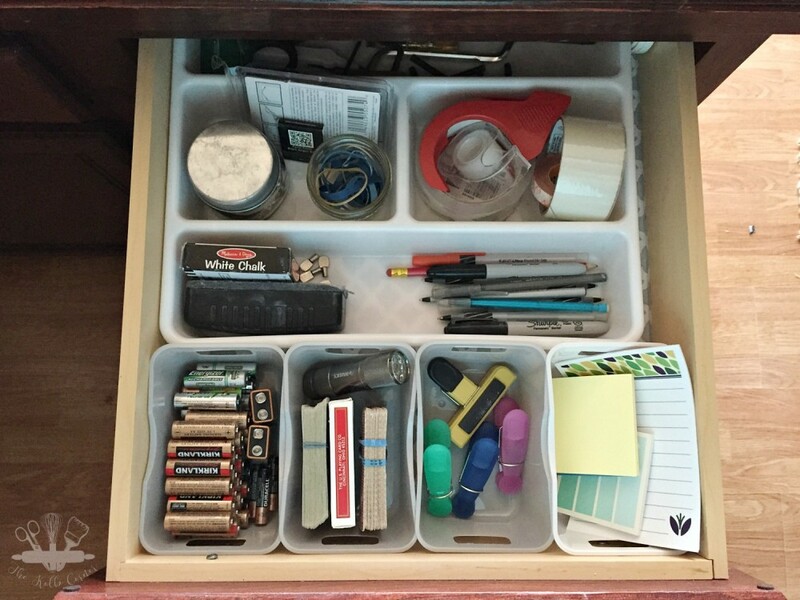 With March in full swing, I am tackling de-cluttering and organizing areas in my home that are in dire need, and this junk drawer was at the top of my list. The best way to tackle an organizing project, whether it be a closet, dresser or junk drawer, is to start with a blank, clean canvas. I don’t know how it happens, but it never fails that the bottom of the junk drawer always gets coated in crumbs and pet hair in my house. Gross! This can be scrapbook paper, contact paper, wrapping paper–any kind of paper. 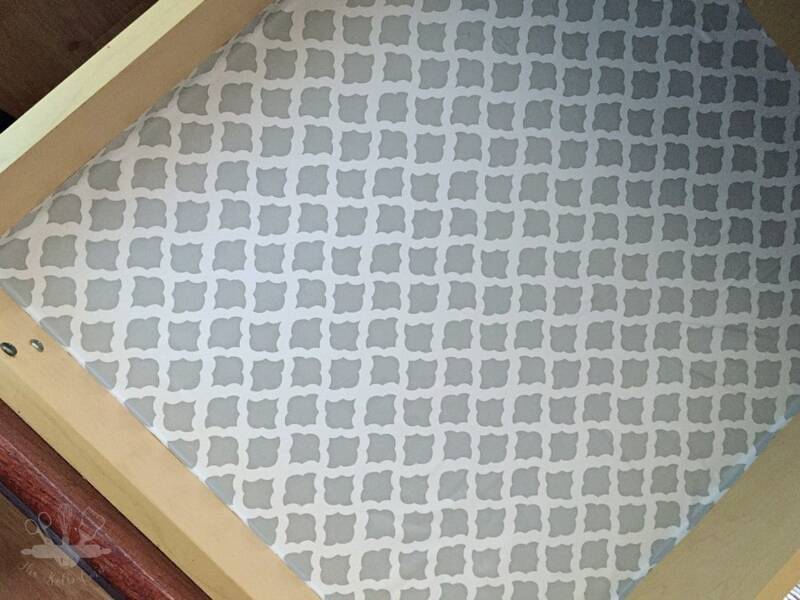 You may be wondering what lining a junk drawer has to do with keeping it organized, but opening a drawer and seeing a pretty pattern sneaking through makes me happy and I’m sure it will make you happy too. 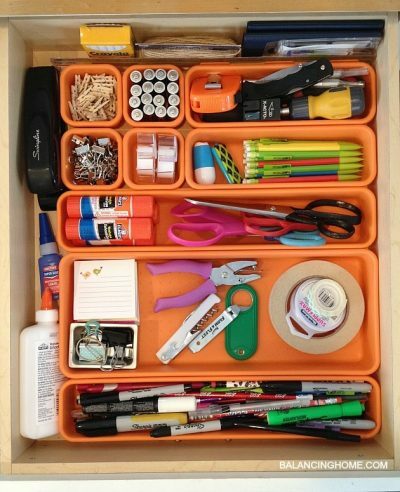 Plus, it gives more motivation to keep that junk drawer clean and organized. Get creative! I happened to have a TON of little plastic baskets that weren’t being used from previous organization projects, as well as a utensil holder I was already using in the drawer. You could use cereal boxes cut down to size, glass jars or aluminum cans (washed out of course) or even build your own custom dividers. 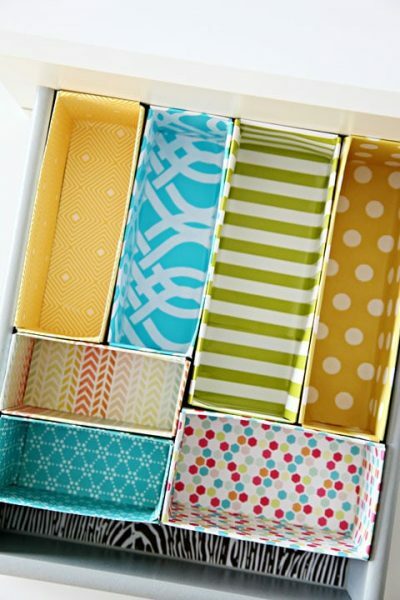 This may be a no brainer, but storing items that have similar uses together makes it easy to keep the junk drawer organized. For example, keeping pens and note pads together, or chalk and erasers, hardware and screwdrivers etc. 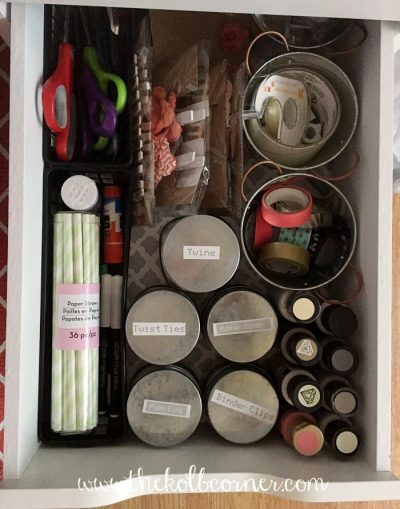 I only have 2 jars in my finished organized junk drawer so I didn’t label them, but if you are using any sort of lidded jar/basket/container be sure to slap a pretty label on it. This way you know what container houses what items and that makes it easier for you (and everyone else in the house) to put things away each time. 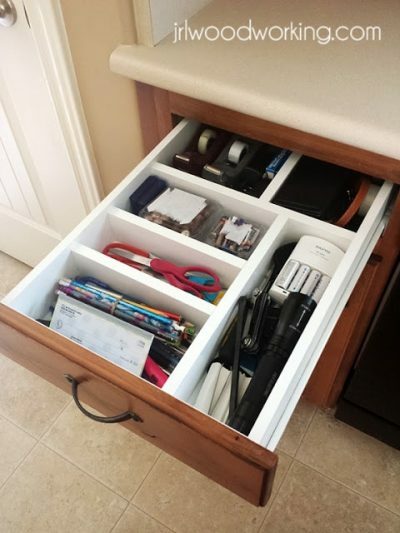 Following these easy steps will help you organize that junk drawer, and keep it that way. Plus who doesn’t love looking at a neatly organized junk drawer? 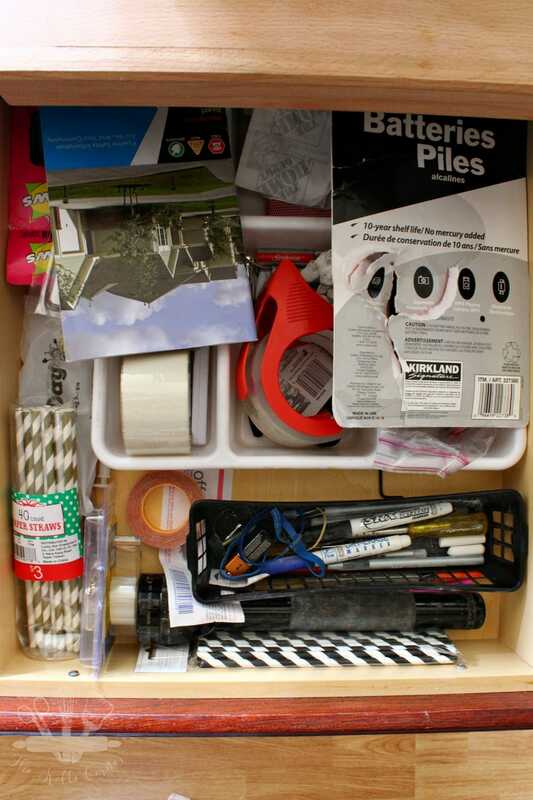 What other tips do you have when it comes to organizing junk drawers? You’ve got me feeling inspired to conquer my junk drawer! It’s stuffed with all kinds of junk! Thanks so much! You’ve inspired me to conquer my junk drawer! It’s stuffed with all kinds of junk! Thanks! Show it who’s boss Dawn!! I remember pinning this post last year because I thought it was so helpful. 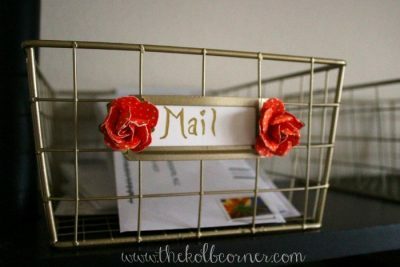 Great ideas for low-cost or no-cost organization items. Thanks for the organizing inspiration. My junk drawers are calling my name! I organized one several years ago and have managed to keep it neat. Now, it is obviously past time to do the rest.